September’s grape harvest, and all the festivities which come along with it, was the last happy celebration of what little remains of the summer season. Now, however, Autumn has definately begun and the prospect of cold, grey weather is becoming a reality. Nonetheless, do not dismay as October too has its own surprises in store bringing us its beautiful golden colours, which not even the summer can rival, and its excellent, ripe fruits. And so, speaking of fruit, this month’s destination has got to be none other than the land of chestnut: the Mugello. The Mugello is an area of Tuscany where a particular type of chestnut called the Marrone is produced. This significant chestnut is noted for its unique shape, size and texture and has a much sweeter taste than most other chestnuts. Furthermore, it was the first product of its type to earn the IGP (Indication of Geographical Protection), a quality label which is assigned by the European Union, recognising the Mugello as a territory which is specially adapted to the cultivation of this fruit. It is here that the fruit, as well as being a precious source of income, has been long used by the local population as the basis for much of its local cuisine, so much so that the chestnut is often referred to as the albero del pane (the bread tree). The harvest of this fruit is still carried out by hand due to the steep, hilly location of the many centuries old chestnut groves, making it impossible to harvest using machinery. As well as those fresh chestnuts, it is also possible to buy dried chestnuts, with or without the skin. Moreover, here it is also possible to purchase chestnut flour which is still made using a traditional method involving the chestnuts being dried out, during a fourty day process using the smoke produced through the burning of chestnut shells, and then stone ground by a waterpowered mill. The end result is a flour which is, as you would expect, very different in taste and consistency to all other flours. The zone protected by IGP quality seal is an area of about 88 thousand hectares around the Tuscan-Emilia Romagnan Appenines. The area contains towns situated in both the Sieve Valley in Tuscany (Borgo San Lorenzo, Vicchio, Dicomano, San Godenzo, Londa and Rufina) and the Alto Mugello region towards Emilia-Romagna (Firenzuola, Marradi and Palazzuolo sul Senio). In particular, Marradi is the producer of the Marron Buono, which is one of the best quality chestnuts in Italy, or even the World. This chestnut is actually largely exported to the East and has been loved by the English for centuries, where it is better known as the Chestnut of Marradi. During the month of October, every Sunday the famous Festival of the Chestnut is held in Marradi. 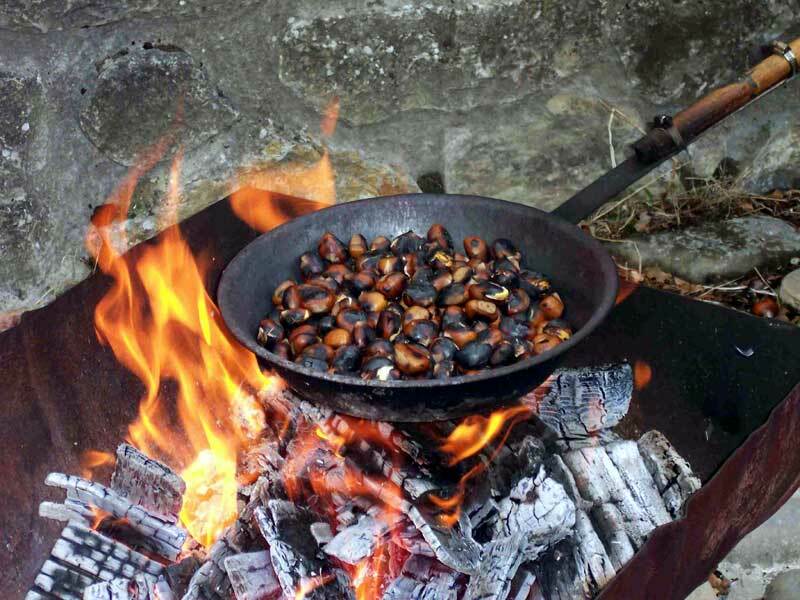 Here the famous chestnuts can be tasted as part of many different recipes, ranging from those simpler ones, such as boiled chestnuts (ballotte) or roasted chestnuts (caldarroste, here called bruciate) to unique specialities such as the delicious chestnut cake. The Mugello is therefore very rich in terms of gastronomy. In addition to the famous chestnuts, this area also produces oil, wine, high quality meats, cheese, honey, saffron and potatoes, the main ingredient of the Mugello’s famous tortelli. Moreover, various types of mushroom, and the white truffle, grow in the woods and chestnut groves of the surrounding valleys. That said, we must not forget that the Mugello is also home to much art and history, with the small village of Vicchio being the birthplace of Giotto and Beato Angelico. Andrea del Castagno is another famous painter coming from the Mugello as well as Giovanni della Casa, the author of Galateo. Finally, the great Florentine Medici family also put down some roots in this illustrious area, as the two splendid castles, Trebbio and Cafaggiolo, can testify.